ATLANTA, April 17, 2019 (GLOBE NEWSWIRE) -- On Saturday, April 13, 2019, more than 2,000 people gathered in Central Park in Atlanta’s Old Fourth Ward neighborhood for the second annual Sharecare Heartbeat Festival, a free, family-friendly event that provides a range of resources and activities to help each member of the community manage and improve their health. Doubling attendance over its inaugural year, the Sharecare Heartbeat Festival was born out of the Sharecare Movement – the joint initiative launched by Sharecare and the Atlanta Hawks to make Georgia one of the healthiest states and Atlanta one of the healthiest cities in the country. (Pictured left to right) Sharecare co-founder and CEO Jeff Arnold, Fulton County District 4 Commissioner Natalie K. Hall, NBA Hall of Famer and Atlanta Hawks vice president of basketball Dominique Wilkins, Georgia Department of Community Health Commissioner Frank W. Berry, and City of Atlanta Department of Parks and Recreation Commissioner John Dargle pose with a proclamation declaring Saturday, April 13, 2019, as Sharecare Day in Fulton County, Georgia. Anchored by the Atlanta Hawks invitational 3vs3 basketball tournament, the Sharecare Heartbeat Festival offered attendees a range of activities to support healthy behavior, such as outdoor fitness classes with Planet Fitness; chair aerobics for seniors and CPR verification training with Nurse Noel; nutrition trivia from Emory Healthcare; healthy cooking demonstrations by Goodr; and juice tastings from Kale Me Krazy. And in the spirit of “sharing care,” festival goers packed and decorated duffle bags for kids in the foster care system at the State Farm Neighborhood of Good booth, and had meet-and-greets with representatives from Atlanta Police Foundation’s Crime Stoppers, a civilian-led initiative to address community problems through crime prevention. Services aimed at supporting those who are uninsured or may lack sufficient health insurance coverage also were available onsite, including: assistance with enrollment in Medicaid and PeachCare for Kids, and care navigation for eligible individuals through CareSource; and Sharecare Rx, a new digital pharmacy savings card to help people save money on their prescription medications, available exclusively through the free Sharecare app. Further, approximately 200 adults participated in free screenings and counseling at the festival to address factors associated with chronic conditions and care gaps such as stroke, blood pressure, memory, nutrition and hearing. Additionally, 45 children under the age of 18 received complimentary eye screenings from Vision to Learn, a not-for-profit organization which also provided free glasses prescriptions for 19 children who were found to need vision correction during their screenings at the Sharecare Heartbeat Festival. To join the Sharecare Movement, download the free Sharecare app from the App Store or Google Play. 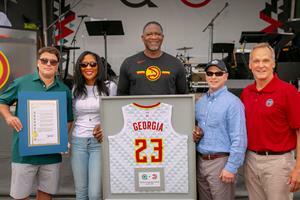 With a bold identity and strong new ownership, the Atlanta Hawks Basketball Club and State Farm Arena remain committed to making Atlantans proud on the court and off. The 2014-15 Southeast Division Champions, the Hawks made the postseason in 10 consecutive seasons and reached the Eastern Conference Finals for the first time in franchise history in 2015. Off the court, the organization has built a culture of inclusion, diversity and innovation, all with a touch of Southern Hospitality. It continues into the community where the organization builds bridges through basketball, whether by constructing and refurbishing courts in Atlanta neighborhoods, providing scholarships to our basketball camps, or surprising and delighting our fans with unique Atlanta Hawks experiences. Atlanta Hawks Membership, which includes your seat for every home game for the 2019-20 regular season, is on sale now at www.hawks.com/membership or by calling 866-715-1500! For more information on the Hawks, log on to www.hawks.com today or follow us on twitter and Instagram @ATLHawks. Click here to download b-roll from the Sharecare Heartbeat Festival.